The Police raid on the Army's Safe House at Athurugiriya was ill conceived and the harsh treatment meted out to the Officer and men was very bad says Defence Minister, Tilak Marapana. He told The Sunday Times in an exclusive interview that the information Police provided in a bid to further extend the detention of the Army officer and men was "hopelessly inadequate." "I made it very clear to the Police that I don't want the Prevention of Terrorism Act abused," Mr. Marapana said. He was commenting on the January 2 raid by Kulasiri Udugampola, SP, Special Operations (Kandy Division), on a Safe House run by the Army's Directorate of Military Intelligence at the Millennium City in Athurugiriya. By his own admission, Mr. Udugampola carried out the raid without the knowledge of either the Inspector General of Police or the DIG in charge of Kandy Division. He seized an array of weapons, arrested an officer and five soldiers. It later turned out that the men and material belonged to the Army's highly successful Long Range Reconnaissance Patrol (LRRP) – a long standing secret which became public together with the identities of the men. The men were detained for three days on a Detention Order issued by the SSP in charge of Kandy Division under the Prevention of Terrorism Act. Subsequent detention, which required a Detention Order from the Ministry of Defence, was refused by Mr. Marapana. "The initial raid, even if it was justified because they were misinformed about the state of affairs, the Army Commander (Lt. Gen. Lionel Balagalle) and the Director of Military Intelligence (Brig. Kapila Hendavithana), informed the Police that this was an Army location," Mr. Marapana pointed out. He said: "They told Police that the persons who had been arrested are Army personnel and that the items that were recovered were Army property. The officer and men have been authorised by the Army to carry out operations using these items. No lesser person than the Army Commander informs of that to the Police and from that point onwards I think the Police are to be blamed. "I can understand if they did not arrest the Army personnel. But they have arrested them, kept them in confinement and from the reports that I got, they have not been treated that well when they were in Police custody. That is why when the Police applied to me for a Detention Order, having kept them in detention for the period that the law authorised them to do so, I refused. I flatly refused because the material they submitted to me to justify the detention was hopelessly inadequate. There is nothing that they have unearthed in that investigation which seemed to suggest that these people (the Army personnel) had been acting other than on orders from their superiors in the Army. They were very legitimate orders. Asked whether the raid and arrest of the Army men led to the disclosure of a "top State secret," Mr. Marapana replied "Well, I would not say this is such a secret. Certainly our enemy would have known of the existence of the LRRP. Nor is the raid on the location. These people used it to come and leave their equipment. Nothing else happened there. It was only a so called Safe House that could have been shifted anywhere. "But as far as the personnel involved, the fact that their identities have been revealed will create a problem not only for them but their families too. More serious than anything else, I feel the harsh treatment that has been meted out to them is very bad. Having done their duty and when they find that they are arrested, detained and ill treated in this way, they are completely demoralised. That is the aspect I am more worried about than anything else. 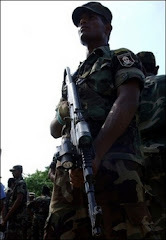 Commenting on the LTTE crack down on what they call "collaborators" with the LRRP teams, after the Athurugiriya raid, including the killing of one alleged informant, Mr. Marapana said "these are very confidential matters between these men and their informants. I don't want to probe into that area." However, he added " Then again, if they had been informants of his group information has leaked as a result of the interrogation or the harsh treatment meted out to these Army men, then someone has made these things public. That is also another aspect that needs to be considered. " Asked whether the wide publicity generated soon after the raid, even before the investigations had commenced, was the beginning of the matter being publicised, Mr. Marapana said "This is the most objectionable part of the whole episode. They (the Police) went with the media to raid this house. This implies that their main target was to get some publicity out of this whole episode. "That is what makes me suspect the bona fides of the Police team to some extent. If they had the national interest at heart and if they really thought that there is a place frequented by Army people with this type of deadly weapons, then one would not have expected them to take the media, go and make a big show of it. They would have in the first place mounted surveillance and gathered information about the house. That is to find out what exactly these people are up to. The raid should have been the last step. "Instead, the moment they receive information, they run to the nearest "Camera Shop" and bring all those media personnel. You can't blame them. This is just a publicity stunt and nothing more than that. Asked to comment on moves by the officer and men to file Fundamental Rights Violation pleas before the Supreme Court, Mr. Marapana said " It is their legal and constitutional right to resort to any legal remedy they have." Commenting on the clashes between Police and Army in Kandy, Mr. Marapana declared "That is a minor incident. Of course, it has escalated into a major one and incidents like this happen time and again. Just like it happens, they subside too. "Not that I condone the actions of the Army officers in coming back a second time. What happened was a slight altercation. The vehicle of an Army officer had been parked in a manner to obstruct traffic. The traffic sergeant had asked the driver to remove the vehicle. "Following an altercation, the reports I have got is that the Army personnel had gone back to their camps and brought another crowd of Army people. I don't know whether this is true or false. "But these are the reports I have got. If that is the case, it is high handed action on the part of the Army. I am sure the Army Commander will deal with those persons for that type of conduct. The investigation report is not yet concluded. The Army Commander has already apologised to the Mahanayakes and the Diyawadana Nilame. The Army Commander and the IGP are jointly investigating this matter. "I don't think there is evil or hatred between the Army and the Police. These are incidents that happen time and again. They are not to be taken all that seriously." During the interview with The Sunday Times, Mr. Marapana also answered questions on wide ranging matters concerning defence and security.